For the best in Yacht Charter Thailand, a luxury yacht charter from Phuket is the obvious way to explore the stunning Andaman Sea and its beautiful islands, crystal clear waters and glorious beaches. Some of the most stunning sailing grounds in the world can be found to the east and northwest of Phuket. Choose from literally hundreds of anchorages and secluded coves that nestle between the countless un-inhabited islands to be found in groups such as Phi Phi, Phang Nga Bay, Similan Islands and the marine national park known as the Surin Islands which are the group closest to Burmese waters. 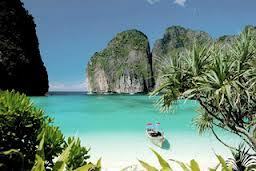 The beach at Krabi is thought by many to be among the most beautiful in the world. The great thing about this area is that the sailing conditions are more often than not good all year round. Anchorages on the west coast offer everything from quiet seclusion to hectic activity. You can take your pick. Providing perfect shelter in the north-east monsoon season, Nai Harn Beach, Kata Beach, Karon Beach, Patong Beach, Bangtao Beach are all favourites with visiting yachtsmen – all be they too busy and developed for some. To the south of Phuket lie the Malacca Straits and the exciting opportunity to sail through Malaysian waters to Singapore. And for the more adventurous there is the chance to sail north west to the paradise sailing grounds of Myanmar’s remote Mergui Archipelago and further on to the equally remote Andaman and Nocobar Islands of India.